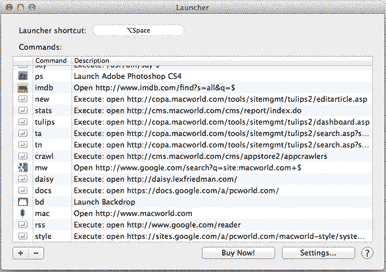 There are dozens of launcher applications available for speeding up your productivity on your Mac, each with their own strengths and peculiarities. Nulana’s Launcher (Mac App Store link) is an admirable addition to the crowd, providing quick and easy access to applications, folders, files, Web searches, system commands (like going into Screen Saver mode), and shell commands. You can layer an additional level of complexity on URLs and shell commands with placeholder symbols, allowing users to create custom searches and multi-part phrases. Searching IMDB with one of these shortcuts is easy: Just set up the shortcut in the preferences pane to open the URL http://www.imdb.com/find?s=all&q=$ whenever you type in the phrase imdb; the $ symbol will fill in with whatever you type after imdb in Launcher’s text bar when you hit enter. If you know any basic Unix commands, you can also create short shell scripts to run upon key commands as well, or use Launcher’s file opener preset to set a phrase to open an AppleScript or shell script. For its price, Launcher is surprisingly full-featured without being weighed down in complexities; on top of that, it’s quickly become an invaluable tool for my daily workflow.